Layna Pimentel gave me one of these, so I’m stylin’ and profilin’! Personally, it reminds me how I really need to spruce the place up a bit. I mean, I guess it’s stylish in a retro, used Salvo thrift store outfit kinda way. Yeah, or not. But anyway, I won and I’m grateful! 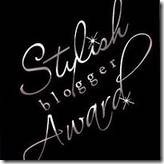 The rules of the Stylish Blogger Award call for me to tell seven things about myself. I’ll give it a shot, trying not to repeat anything I might’ve said before. I have lived in what can be described, to varying degrees, as “college towns” for 10 years, now, and I’ve loved it! I have Huey Lewis & The News’ whole catalog. Shut up. I videotaped the entire Jon Pertwee run of DOCTOR WHO off the local PBS station when I was a kid. I know enough knife fighting techniques to know how dangerous a prospect it is. I, however, am not really much of a threat to anyone. I never considered myself a “horror writer,” though I guess, technically…? …to see if email posting works properly on this here blog.